Farmers in the Mekong delta have stored fresh water as preparation for the upcoming drought since now. Farmer Dang Van Long in the Mekong delta province of Dong Thap’s District Lai Vung said that though the drought comes late this year, farmers still take heed to it because weather is unpredictable nowadays. In addition to keeping more water, farmers estimate water volume in farm ponds and plan pond water use for dry-season crop and animal production and cover trees’ roots to avoid sun light. The Southern Institute of Water Resources Research (SIWRR) yesterday said that water level in the upper Mekong River is high. It was measured 8.15 meter in the Kratie station in ten first days of April. It is predicted that the water level will maintain around 8 meter ensuring the salinity not intrude in the river gate. Water level in Tan Chau was measured from 1.29 to 1,47 meter in early April while it was 1.42-1.61 meter in Chau Doc. It is predicted that tide will affect river water level. Accordingly, fresh water level in Mekong delta provinces of An Giang, Dong Thap and Vinh Long is enough for daily activities and growing. 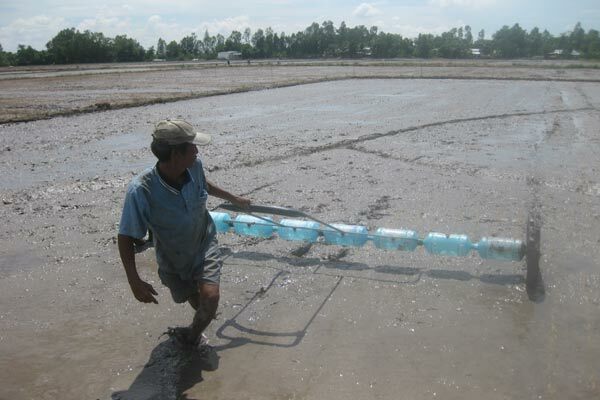 However, locals in coastal areas in Ca Mau, Ben Tre, Tra Vinh and Soc Trang have been keeping fresh water in stocks for preparation of drought and salinity intrusion. Farmers want to grow summer-fall crop earlier than previous years. Because tide is low this year, less fresh water will be in Ca Mau, Soc Trang, Kien Giang and Hau Giang provinces.